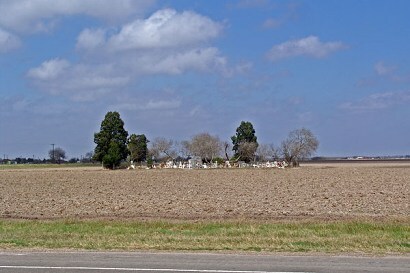 Cemetery in the middle of the field. The area around present-day Los Indios was an original Spanish land grant dating from 1789. The name is thought to come from an 18th century ranch. 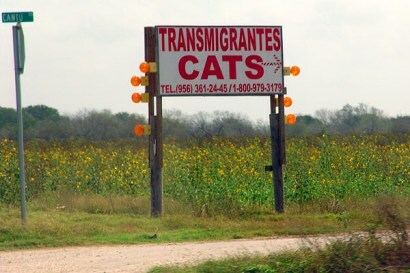 Modern Los Indios began as a shipping point on the San Benito and Rio Grande Valley Railroad in 1913. A post office was granted that same year and a store appeared the next. The first population figure available is from 1925 when 25 residents were reported. It increased to 150 by 1927. It managed to survive the Great Depression and the 1940 census reported the 1927 figure of 150. From the early 1940s through the 1960s, Los Indios used 100 for it’s population figure. Its businesses closed, leaving just two in the late 1960s. The railroad stopped in 1949 and in the mid 1950s, the schools merged with The San Benito ISD. From the late 1960s through 1990 the population was given as 200 and businesses fluctuated between one and four. A colonia sprang up alongside Los Indios in the mid 1970s, boosting the general population by over 700. The colonia shrunk by about half in the mid 1980s, but Los Indios has gained population – reaching 1,149 for the 2000 census.